Blogswarm. Post. Get to it. sorry. i discovered late last night that a certain “assistant” of mine who we wound up parting ways with last month never even got started on (let alone got it done) a huge print order that sadly included an entire reprocessing, thanks to incompatibility issues between settings in older versions of Adobe® Camera Rawgah! so, i’ve got to reprocess and kick some 500 photos out the door by tonight…or at least before opening of business tomorrow in order for the happy couple to get them when they want and for me to be able to move on to other things before i leave to go shoot a wedding in the prairie-riffic boondox of western “Sodakia”, (as i refer to our fine abortion-obsessed state). after i get done with that, i’ll be commenting on this following article, sent by a friend of mine down in the Texas Republic from an undisclosed newspaper that I haven’t had the time to research yet. The law, House Bill 2685 by Rep. Warren Chisum, a conservative Republican from the Panhandle, prompted derisive comments from opponents who called it the worst sort of government intrusion. It calls for couples who take an eight-hour “successful marriage” course approved by the state to get a free marriage license, with those who don’t paying a doubled fee of $60. EDIT: reduced to pertinent snippet and linked to the article. · Why a Theocratic State Isn’t Necessary, wherein i provide my unsolicited two cents as to why i believe this country would survive quite well without moving forward in its current trend towards a legislated theocratic deference. · How Sciolism Defeats Discourse, wherein i describe what i believe to be the root of the miscommunication between evangelicals and other conservatives, and certainly between evangelicals and the rest of the world at large. Sciolism, to cut to the chase, is best described as “superficial knowledgability”. for all the obvious reasons, i will be blogging more along these lines, and others, throughout this blogswarm. i am, however, still trying to catch up on several client endeavors today after six days out of the office, and in preparation for another four days away later this week. this is NOT an anti-religious endeavor. that those who would prefer that this country be run as a theocracy happen to be religious zealots is a rather obvious by-product of the tenacity of their faith. that such people become mortally aggrieved whenever someone disagrees with this is a by-product of their sciolism. this is NOT an anti-religious endeavor. many of the individuals who participate in this Blogswarm Against Theocracy are religious persons who hold a firm and steadfast belief in their God (or Allah, or Jehovah, or Whomever), but who happen to be offended by the politicization of religious and spiritual principles. i do not happen to fall into a religious category, but nevertheless, i deeply respect their moral clarity in this regard. this is NOT an anti-religious endeavor. it is a fairly logical extension, under the Bill of Rights, by those who which to protect the founding principle of Separation of Church and State, which was, incidentally, instituted by persons of clear religious disposition and far greater insight into the matter than the pundits and idealogues of today. 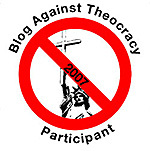 The Blog Against Theocracy returns July 1-4, 2007. The first “BAT” was a huge success. Yours truly will once again be making relevant posts here as well as working with Tengrain and Morse over at Mock, Paper, Scissors (tip of the helmet to Tengrain for the “BAT” logo again). If the subject matter is foreign to you, I encourage you to check out Talk2Action and First Freedom First to learn more. Ah, you came back. Thanks for that. This won’t be so long, because the thing that makes a group of people tend towards the dismissive is fairly easily identified. Neoconservatives are very quick to dismiss the “Blogging Against Theocracy” endeavor as one born of fear. We are apparently so afraid of Christianity, that even allowing a piffle—a tish, a skosh, a teeny bit—of it in our lives is too much to bear. Yes, yes, I know. It’d be a wonderful life if everything were so obvious! But of course, despite its inherent untruth, this argument is the most commonly chosen because it is the one stance with which they can readily identify. One of the things which continually strikes me as I discuss “faith” with my religious friends, is that they tend to forget the entire premise of faith: that that in which they believe might well not be true. For if it was inherently true, there would be no need to have “faith” in its truth. If all the elements of a religious belief were known, scientific fact, faith would cease to exist, replaced by knowledge. And yet repeatedly, evangelicals speak about their “faith” in terms of what they know. They know the Word of their God is Inspired. They know He died for their sins. They know He rose from the grave. And yet, somehow, they wrap it all up and refer to this supposed knowledge as faith, implying that their knowledge may well be unfounded! Yeah, have a sip of that wine or beer or whatever. This stuff makes my head hurt, too. Answers like that, and the rebuttals you see to this endeavor from the evangelicals, are easy. I don’t think they’re malicious by any means—and let’s do keep in mind that most of these people merely do what they believe is the right thing to do!—but such responses are a form of fear-mongering. And fear is the root of sciolism. After all, the most formative periods of growth in any religion are during those times when it’s being persecuted. It’s a human nature thing: we perform more efficiently, and often more effectively, under duress. And goodness knows that with the ease of making a few Moslem extremists look like an entire religious society (a theocracy, no less) is set against “America” (which to fundamentalists means “Christians”), the neoconservatives are under a lot of duress. Even acknowledging that there is at least one religion in the world that is practiced by more people than those who subscribe to the tenets of their own faith must have been difficult. One last sip. We’re almost done. So now, they claim their religion is being attacked on all sides. All they want to do is have a little prayer, and we “unfairly” want to keep them from doing so. Read Bob’s interpretation of the tenets of this endeavor that I shared with you yesterday. It is written from fear. We’re out to get them. We’re out to force them to change their ways. We’re out to undo all the good they’re doing. We’re out to redefine their definition of “good” and “right”. And it’s oh-so-easy, and ever so disingenuous, to describe us in this manner, because Bob and people like him honestly fear the fact that responsible members of society might hold a faith that differs from their presumption of knowledge. That’s a by-product of sciolism, for they have failed to understand what we’re talking about, just as they fail to understand the true intent behind the actions of church leaders on the national level. People like Bob may not intentionally be wanting a theocratic state (and for what it’s worth, I believe his assertion in this regard), but I do not believe the same is true for those for whom neoconservatism is a business. But what is most striking—and of most concern—to me is the depth to which these fundamentalists fear themselves. If they truly had faith in their religion and their ability to teach and enforce its tenets, then what would they have to fear by not infusing public education, political discourse, and state and federal legislation with their religious beliefs, practices, and interpretations? If their God is truly all-powerful, what risk is there in leaving the religious education of their children to home and church? Let us not forget, that no matter what happens in the world at large or in their private lives, they will say that it was God’s Will that whatever-it-was came to pass. And if that’s really true, what is the harm in leaving science to scientists, literature to academics, and religion to the priests and ministers? If they truly have faith in their chosen way of life, then people like myself would simply be targets for that “Go Ye Therefore” doctrine, right? We wouldn’t be “the enemy”, and neither would anyone else. Instead, due to their sciolistic review of their own religion, “preach the gospel” has become “make up a new ‘science’ and try to teach it” and “attempt to pass anti-abortion legislation instead of trying to extend the definition of ‘life'”. Because those things are easier to do, dismissively treating dissenting views as reactionary. It’s easier, you see, because that way, proponents of their “faith” will band together and work harder for their “cause” under this manufactured duress, as opposed to having faith, even in themselves. Fear has become the new faith for them, and Fear is a much more demanding god than what they had before. Imagine a world where people of diverse ideas can discuss important topics without burning straw men. . . .a world in which our natural, innate curiosity is shared by adult members of all political and idealogical persuasions. . . .a world in which it is by no means satisfying to glance at a thing—an idea, a principle, a philosophy—and consider it known. . . .a world in which a dismissive attitude towards the things which question one’s sense of normality, emotional security, or even personality, would be a foreign concept. Imagine a world, in other words, devoid of the vagaries of all those things which have become the hallmarks of neoconservative philosophy: hypocrisy, duplicity, intolerance, sanctimony, deceit, guile, pretense, and sciolism. Now, take a sip of whatever that is you chose to drink for this, and bear with me, because I’m about to address something that most, if not all, of us participating in this Blog Against Theocracy have been tap-dancing around, to our collective detriment. For in our attempt to be respectful and considerate, we have left this relatively indefensible word, “theocracy”, dangling out there, ripe for the picking. After all, there is, to all perception, no overt movement to set aside the First Amendment, so when we use this word “theocracy”, it is easily dismissible by those invested with a solopsism so self-definitive that they truly do not understand the relevance of differing opinion. And as a result, our mission is undermined at the outset, victim to the sciolistic tendencies of evangelicals, who honestly believe that in cursorily perusing a few posts relating to this endeavor, they understand not only our mission, but our impetus and our history. And I’m very sorry, but there’s really only one religion in America which attempts to suborn the separation of Church and State instead of confronting it directly. I don’t need to name it. Theirs is a facile stance for argument, you understand, because it inherently makes all counter-arguments reactionary, and our being reactionary is something the more juvenile among them take great pride in pointing out. Another sip, if you will, because I must beg your patient indulgence in explaining this. So, shortly thereafter, one of South Dakota’s most extreme voices signs on with this as rebuttal. Go ahead, click the link and read the whole thing; it’ll open in another window for you. An excerpt follows. Did you catch all that in the full post? The dismissiveness, obviously barren of any investigation (let alone concern) whatsoever into whatever it is we’re talking about as “theocracy”? The deliberate rendering of an anti-theocratic stance as anti-Christian. The placating tone of one who not only firmly believes what he believes, but who is palpably unappreciative of the fact that SOMETHING might be going on in the world that could at the very least be construed as sowing the seeds of religious hegemony? And why should he be appreciative of it? If a theocratic state is eventually founded on his principles, then the right thing would obviously have been done. There are many points on which his post could be rebutted, and not the least important of those would be the fact that many of those participating in this endeavor are religious individuals. He’s got digg on his blog, so you can agree or disagree with him on your own accord. But my point here is not what or how Bob thinks. Far from it, for Bob and everyone else are quite welcome to their own thoughts. Bob is merely an example of how certain people think, or fail to think. I don’t even care that he is a devout Christian, for even more fundamental than that, Bob is a sciolist. That is, one who indulges himself in superficial knowledgability, both to his own detriment, and to ours. A rational discussion on this subject cannot actually be held with sciolists, for they do little but utter rhetoric while pretending such utterance invests them not only with holiness, but with the right to expect all others to subscribe to their belief in what is holy. Sciolists will skim over a dissenting writing, or worse yet, just hear about it, and presume that not only can they rationally refute it, but that they can also argue the dissenting point and play “devil’s advocate”. It is in this way that our discussion of the imminent theocracy in America is immediately curtailed, for when we talk, or write, or post, we are precluded from effective communication by the very act of intentional, willful, directed ignorance—sciolism, in more succinct terms. And as long as Bob and people like him indulge themselves in this sanctimonious pretense of understanding things which they dismissively ignore and impugn, we will continue to have to operate on the same level as political extremists. And what is most aggravating about that is the fact that working to protect the First Amendment is at least philosophically as centrist as one can be. Oh, by all means. You need another drink? No worries. I’ll wait for you. Like I said, this will take a while. i have been invited….well….he invited kinda all of us who comment on his blog, and i said i’d love to, then he came back this evening and gave me the formal invite…. to guest-blog on Mock, Paper, Scissors for the Blog Against Theocracy blogswarm this weekend. i am stoked, and honored beyond words. and of course i’m obviously looking forward to it. i have several posts already in the planning stages. the South Dakota-centric ones will be posted here and on Clean Cut Kid, while the nationally-oriented or just plain generic ones will go over to Mock, Paper, Scissors. thank you, Tengrain. i’m really looking forward to it, and i hope i won’t embarrass you or anything.